An easy fruit pizza recipe which is not only delicious, but also like all great pizzas, one where you can choose your favorite topping. A wonderful treat for summer parties. Here is an easy recipe for a tasty fruit pizza that you can have ready for eating in around two hours. If you're planning a summer party, or if you would just like an alternative to your usual summer desserts, this pizza will make a delicious addition to your display table. Are you thinking of something different and a little more unusual to eat at your Fourth of July celebrations? Or maybe at the Holidays too? 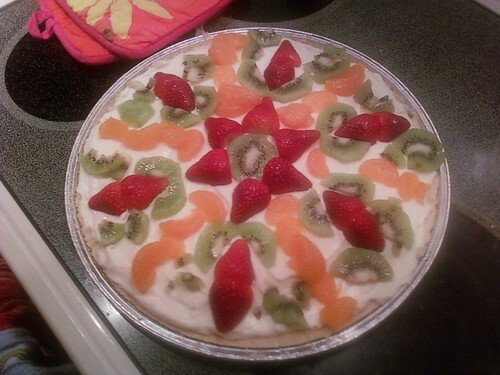 Why not wow your family and friends with this fruit pizza? It is that simple even the kids could help you in its preparation. Cooling, refreshing and irresistable, it is just right for the warm months of the summer, but can surely fit the bill at any time of the year. If you are preparing this dish other than in the United States, please see the link below for measurement conversion. 4 cups of Corn Flakes cereal (crushed to 1 cup) or 1 cup Corn Flake Crumbs. 2 tablespoons margarine or butter, softened. 2 tablespoons light corn syrup. 2 packages (8 oz. each) light cream cheese, softened. 1 jar (7 oz.) marshmallow cream. 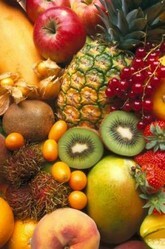 2-3 cups sliced fruit fresh or canned, well drained. Calling all crispy pizza lovers: this is the pizza pan for you! The perforated design lets air flow through to give you a nice, crispy crust. It's pizza night at your house with a homemade or a store-bought pie and this 14-inch non-stick round pizza pan. This set features 2 pizza pans that are great to have on hand when you have a hungry crowd to feed. Recipe Right non-stick pizza pans allow for easy food release and quick cleanup. One. In a medium mixing bowl, combine the Corn Flakes cereal, sugar, margarine and corn syrup. Press mixture evenly and firmly in to the bottom of a 12-inch pizza pan. Two. Bake at 350F for around 5 minutes, or until lightly browned. Cool completely. Three. Combine cream cheese and marshmallow creme. Spread over crust. Four. Arrange fruit over cream cheese mixture. Chill for around 1 hour or until firm. Serve cold. Preparation time for this delicious fruit pizza is around 30 minutes and will serve 12 regular portions. Although the fruit pizzas above were not prepared by myself, they give you an idea of how decorative this dessert can appear. If you have a themed event, you might try arranging the fruit in the shape of a motif, symbol or numbers for a birthday or anniversary. Perhaps even your national flag. I have seen those decorated to resemble Old Glory, the American flag, something very appropriate for the Fourth of July celebrations. As a Brit, I also noticed that some clever soul had arranged the fruit to appear like the Union Jack. The flag idea may be a little more time consuming, but the end result does look stunning. It seems that whatever occasion you are planning, the themes and ideas for this fruit pizza are endless. Would You Try Fruit Pizza? Sounds good to me! Yum! We have and we love it! Oh yes! I have eaten similar many times. Delish! Yes, this one sounds good with the cream cheese and marshmallow cream. Makes the fruit palpable! A useful guide to converting American weights and measures to their British equivalent. Your comments about this fruit pizza recipe are welcomed! A great summer treat for kids. So nice, love this can't wait to try it. I had a great raw veggie pizza recipe and lost it years ago, you wouldn't happen to have one of those as well? Fruit pizza. I wonder what the Italians in my family would have to say about that! This is crazy, I would have never thought of fruit pizza! Wow. Makes a great summer treat or a Holiday dessert. Thanks. Oh my, that looks great. I may have to try a "mini" version of this. Thanks for the recipe. 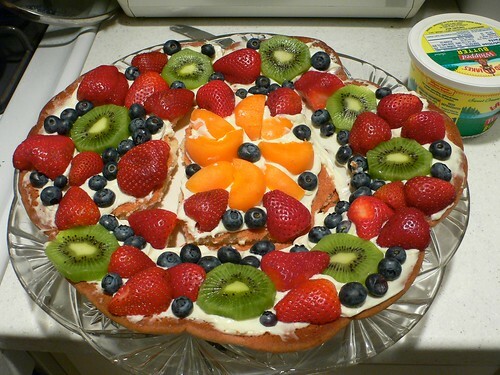 I made something a bit like this at the weekend, I never thought to call it a fruit pizza though! Yours looks tastier. Ah, thanks for the reminder. My sons used to make this with their aunt when they were so small that they had to stand on a chair at the counter. We should have a fruit pizza again soon, it will be interesting to see if they remember SMOOSHING the fruit onto the pizza. Very nice design to it! Thanks for this. Enjoy one of late summer’s favorite fruits in a rich cheesecake. My recipe makes enough for a crowd. Apple and Plum Crisp or Fruit Crumble makes a delicious fruit dessert that is sweet with just a little tang from the apples. Crisps or Crumbles make tasty treats from excess fruit.